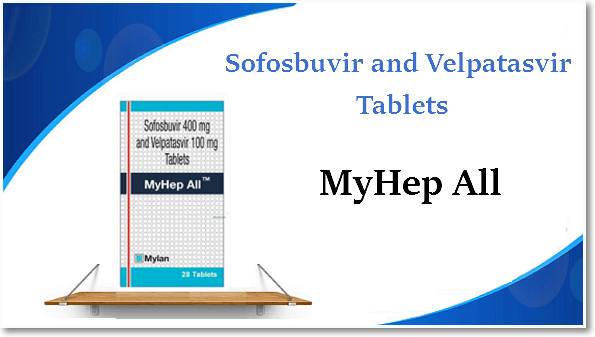 MyHep All is an oral fixed-dose combination tablet of Sofosbuvir 400 mg and Velpatasvir 100 mg, used for the treatment of adults with genotype 1–6 chronic HCV infection. In phase 3 trials involving patients monoinfected with HCV, MyHep All once daily for 12 weeks provided high rates of sustained virologic response (SVR) in HCV treatment-naive and previously treated patients infected with HCV of all genotypes. Sofosbuvir component of the drug is an inhibitor of the HCV NS5B RNA dependent RNA polymerase, which undergoes intracellular metabolism to form uridine analogue triphosphate and inhibits the viral replication by incorporating into HCV RNA and acts as a chain terminator. Velpatasvir is an inhibitor of HCV NS5A protein, which blocks the action of the protein and inhibits the viral replication.